The very first 2019 GMC Sierra AT4 made its world debut at this year’s 2018 New York International Auto Show. This is more than just another pickup, this is an off-road beast specially engineered by GMC to provide everything you’d want from a pick-up and off-roader, while also having the ability to survive in the urban jungle, too. While the next-generation Sierra is kicking around, too, the 2019 GMC Sierra AT4 sports distinctive design features that set it apart from its pickup brethren. Featuring unique body-colour bumpers up front and in the back, along with a body-colour grille along with LED fog lamp bezels and the use of black chrome all give the AT4 a tough, stylish road presence that’s sure to turn heads. But fear not, the Sierra AT4 isn’t just about looking the part; it’s about getting the job done, too. 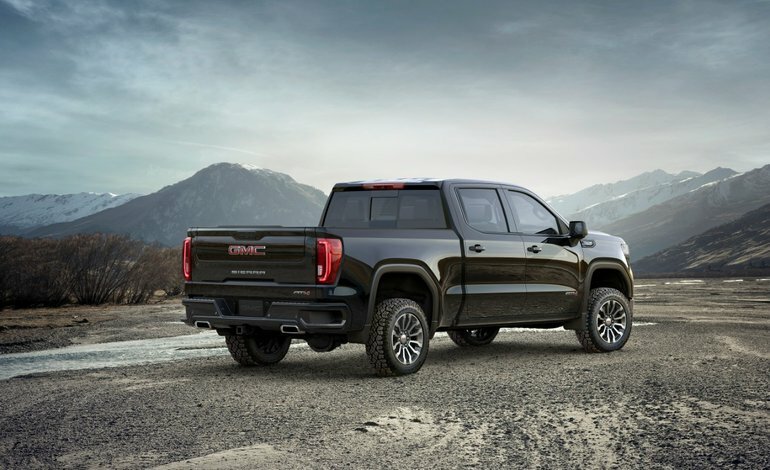 The 2019 Sierra AT4 sits 2” higher than the generic Sierra model and sports a factory-installed off-road suspension system verified by GMC engineers to offer the best and most comfortable and capable off-road ride. To add to the off-road-ready features on the AT4, there’s also a 2-speed transfer case, off-road tuned Rancho monotube shock absorbers, locking rear differential, hill descent control, skip plates, and it comes standard with four-wheel drive. For the time being, the 2019 Sierra AT4 is equipped with a 5.3L V8 engine paired with an 8-speed automatic transmission, however, soon there will be an available 6.2L V8 and new 3.0L inline-6 turbo-diesel to choose from, as well. In a segment first, the 2019 Sierra AT4 is equipped with a full-colour head-up display that also features off-road stats. There’s also a Surround Vision camera system that offers a bird’s eye view of everything around the AT4 for better maneuvering and handling in any and all situations. Two different bed sizes (short and long) as well as a host of storage options inside and out ensure this truck is as capable and practical as they come. Arriving later in the year, the 2019 Sierra AT4 is more than just a truck, so you’ll want to head down to your local Surrgenor Barrhaven dealer today to speak to an expert about everything this all-new off-road pickup has to offer, and don’t forget to book a test drive, too.